The next VIWG meeting will Tuesday, April 9th starting at 7:15 pm at Lee Valley Tools in Colwood. Come early and do some shopping. Our presenter will be Arnt Arntzen. Arnt has been designing and building his furniture in Vancouver since 1986. He is represented by several galleries in Western Canada as well as on his website http://www.arntarntzen.com/. His work is best described as highly refined reclamation. He extensively uses slabs and reclaimed wood as well as previously loved-metal and aviation materials. There will be a wood sale Sunday, April 7th at 6583 Wallace Drive starting at 10:00 am. We will have good quantity of arbutus (half seasoned) and Garry Oak (milled in fall 2018). We sell in 50 board foot lots and thanks to our amazing wood committee volunteers pricing is a very low $2.50 per board foot. A special invitation goes to our new members (even if you are not interested in purchasing wood). We hope you will come and meet some members and see how we conduct our lively sales. I will need six volunteers to assist me beginning at 9am. If you can volunteer (mainly setting out wood in lots before 10am), if you haven’t already, please contact Phil Makin at 250.592.4033. On behalf of the entire Wood Recovery Team, we hope to see you there. If you have any questions, just give me a buzz or email pmakin@shaw.ca. This year, 2019, the Guild Executive again approved the purchase of wood for eight Greater Victoria schools. Seven pickup trucks went to the mill in Chemainus, Paul Beltgens of Jemico Enterprises Ltd was there to greet us. Paul offered us about 3000 board feet of maple that had knots and cracks at no charge. The 7 pickup trucks delivered that wood to the schools and then six of the same vehicles went back to Chemainus the next week to pick up another 3000 board feet of cabinet grade alder for the same schools. Each school received from 100 to 500 board feet of lumber. The amount of wood each school received depended on the number of students they were teaching. The schools receiving the wood included Mount Doug, Oak Bay, Victoria High, Claremont, Belmont, Edward Milne, Glanford, John Stubbs and Lighthouse Christian Academy. The schools were extremely thankful for the wood that they received. Thanks from the Guild for the generosity of Jemico Enterprises and to the drivers who donated their time and costs to deliver the wood to the schools. The Wood for Schools Program is made possible by the success of the Wood Recovery Program so that the Guild could supply this wood to the schools. A workshop of cutting dovetails was given by Steve Neil at Lee Valley on Saturday, March 30th. Six Guild Members joined Steve for a day of learning the finer points in cutting dovetails. By all accounts, the workshop was a huge success. Thanks to Steve for giving up his Saturday. 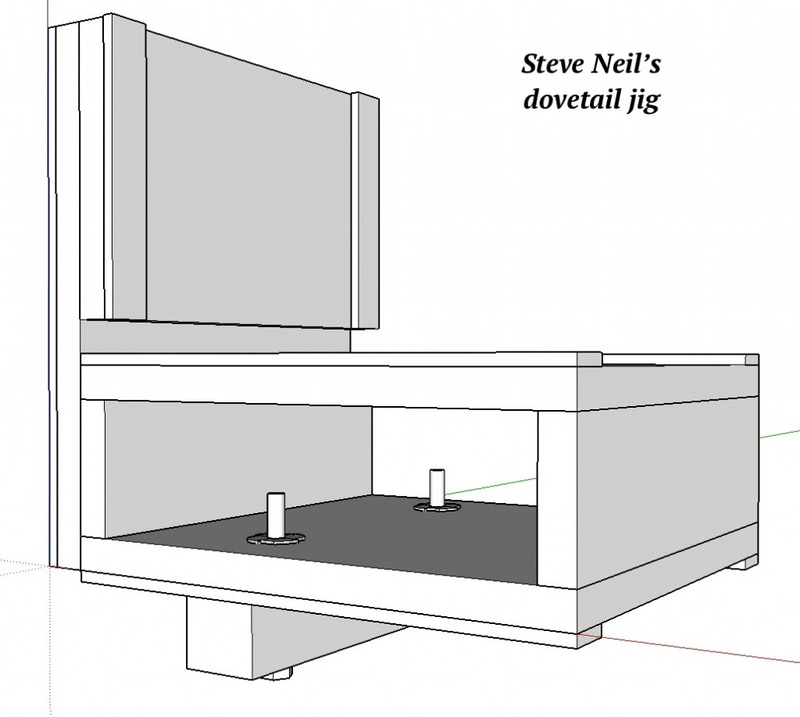 The details on making the dovetail jig can be found by clicking here. The spring challenge is for any type of “miniature house.” The house can be for animals, dolls, fairies, ants, you name it. The only stipulation is it needs to be physically present at the June AGM meeting to be eligible. Do You Have Some Workshop Items You No Longer Use? Then bring them along to the Guild meeting and give them to Randy so they can be part of the evening raffle.